When you think of robots, you might picture a vaguely human-like machine marching around in a futuristic setting or perhaps you think of a massive arm swirling around objects on an assembly line. A new generation of robots has come on the scene and is growing in numbers and capabilities. First developed by General Motors in the mid-1990’s, collaborative robots, also called cobots, are designed to work with humans in manufacturing, warehouses, and other settings. With the development of new technology and applications, they’re gaining popularity. “Currently, collaborative robots only make up about 3% of all robot sales. This number is expected to jump to 34% in 2025” according to the Robotic Industries Association (RIA). Why consider a collaborative robot? 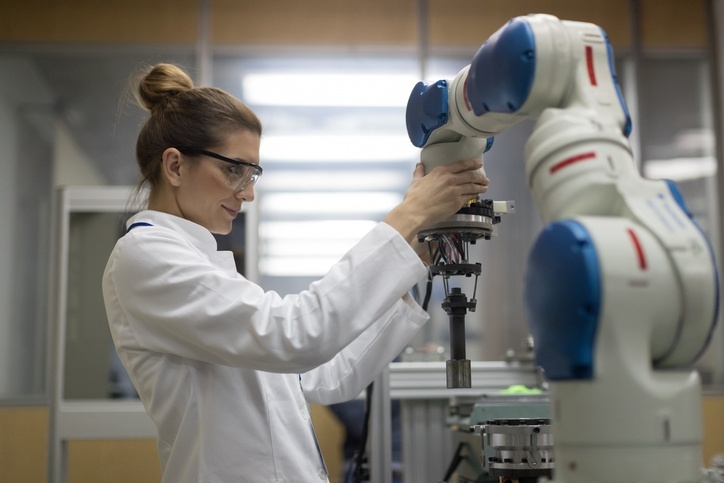 Cobots can increase throughput, reduce stress and potential injuries to employees, and even transition them into more meaningful and skilled work. As collaborative robot technology continues to advance and improve, prices drop so you could see a return on your investment in a few years or less. If you shop carefully and study the specs, your cobot investment could benefit you well into the future. This might bring to mind images of a job shop filled with automated equipment and no human beings in sight. The reality is collaborative robots exist to help humans, not to replace them or eliminate their jobs. Tasks that are tedious and repetitive are not only boring, they pose risks of error or injury as workers become fatigued. An employee may slow down or miss a step at the end of a long shift, but a cobot never falters. Cobots are also a great way to accomplish simple tasks more quickly. A robot with a gripper can move a workpiece from a tray to a precise spot on a bench. This allows its human coworker to perform complex assembly, fine detail work, or another higher-level task without having to reposition the piece or reach for the tray. “It is increasingly recognized that collaborative robots elevate human workers from positions of mundane and repetitive natures to more specialized roles, valued more highly by both companies and individual workers alike,” writes Sean Balogh on the RIA website. They also offer flexibility. Many models are easily programmed with a user-friendly graphical interface or by hand-guiding the robot arm through the needed movements. No coding expertise is required, which means a robot can be used in more than one location and easily “trained” by the humans working alongside it. It also means that as your processes evolve, your robots can still be used. Flexibility also comes from the variety of grippers and tools available. End of arm tools (EOAT) are often easy to swap out, allowing the robot to do a variety of tasks (e.g. pick up, weld, grind, dispense). Some models can be equipped with vision cameras and sensors to enable the robot to scan items and distinguish one piece from another. Payload - This is the combined weight of the workpiece and any tooling. To determine the amount of weight your cobot can safely handle, subtract the weight of the end-of-arm-tool from the maximum payload. While most cobots have a maximum payload between 4 and 10 kg, some have a capacity as high as 35 kg (77 pounds). Reach and rotation – Cobots generally operate from a fixed location and have a maximum reach of about 71 inches. Consider how many degrees it will have to twist and turn as it operates too. Cycle time/speed – Working in proximity to humans means the robot must maintain a safe speed to avoid injury and collision. Size – Most cobots are small enough to mount on a tabletop or other work surface, which could limit the size of workpieces or tools they can manipulate. Built with the purpose of sharing a close work area with humans, cobots are designed to maximize safety. They have rounded corners, smooth surfaces, and no sharp edges, all of which help prevent injuries due to a collision. Gripper force and speed (along with human pain thresholds) are studied to avoid accidental pinching. Cobots are also equipped with sensors and software that tell the robot to stop if it gets too close to a person. Of course, it is critical to make sure sensors are in good working order and that software is running correctly. Are cobots right for your applications? Trust the experts at Force Design to help you navigate the world of cobots and all things automation. Contact us today to learn more.